Muppet Central News - Muppets to star on "The Nick and Jessica Variety Hour"
Muppets to star on "The Nick and Jessica Variety Hour"
Nick Lachey and Jessica Simpson are getting a full hour of wackiness and song. They'll star in a one-shot television special on ABC called "The Nick and Jessica Variety Hour." It will feature a series of sketches and musical performances featuring the 'Newlyweds' stars. 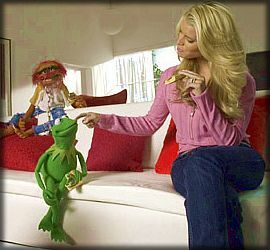 Guests include Jewel, Babyface, Kenny Rogers, Baseball Hall of Famer Johnny Bench, Mr. T, Kermit the Frog and Miss Piggy. Lachey and Babyface will do a duet of the Stevie Wonder song "For Once In My Life," and Simpson and Jewel will sing "Who Will Save Your Soul." "The Nick and Jessica Variety Hour" will air on April 11.